Eden Hazard scored twice in a brilliant display as Chelsea beat Newcastle to briefly draw level on points with second-placed Manchester United in the Premier League. On his return to the starting XI, Hazard fired the Blues level with an angled strike after Dwight Gayle's poked effort had given the Magpies a surprise lead. Striker Alvaro Morata made it 2-1 to the hosts when he headed in from close range following Victor Moses' driven cross. Hazard made sure of Chelsea's 10th league win of the season with a penalty after Matt Ritchie fouled Moses in the area. Chelsea's victory moved them to within eight points of unbeaten leaders Manchester City. And if they are to make it a three-team title race, keeping Hazard in peak condition could be key. Nine shots, six on target, and two goals underlined why, of all manager Antonio Conte's riches, it is the former Premier League Player of the Year he cannot do without. It was Hazard who brought Chelsea level after they were handed an early jolt by Newcastle. Cesar Azpilicueta's ball from the right was blocked by Florian Lejeune but the loose ball found its way to the Belgium international, who smashed in his seventh goal in 10 games. The home side then took control and led 12 minutes before half-time when Moses, who like Hazard was brought back into the line-up, fired a cross in the direction of Morata. The Spain international nodded in from barely a yard out. Newcastle, perhaps fearful of a capitulation similar to the one they had at Old Trafford recently, sat back after the break. However, Chelsea still found gaps and won a penalty when Ritchie brought down Moses. 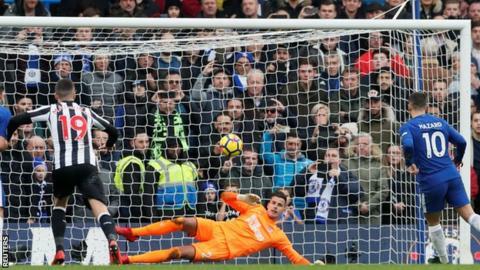 The unflappable Hazard dinked the resulting spot-kick past Karl Darlow for his sixth goal against Newcastle in the league. The Magpies keeper then denied the Belgian a hat-trick when he stuck out a hand to claw away a shot. Hazard was substituted to a standing ovation moments later. It was the least he deserved. Defeat at Stamford Bridge means it is now no wins in six for Rafael Benitez's Newcastle. Asked in a post-match interview why that was the case, the Spaniard replied: "It's the Premier League." Just as they had in the opening quarter of last month's match at Manchester United, the Magpies took the lead. Gayle, who started in place of Joselu, tapped in after following up Thibaut Courtois' parry from Jacob Murphy's shot. Then, once again, the difference in quality began to show. The usually reliable Ritchie conceded a penalty and made a mistake for Chelsea's second, midfielder Mikel Merino misplaced passes, and bar his goal Gayle only had one other touch in the Chelsea box. Newcastle can assert their authority in games but appear not to have the players to sustain it. They remain five points clear of the relegation zone but come January could easily find themselves in yet another dogfight. Match of the Day pundit Alan Shearer said: "Eden Hazard was unplayable at times, Newcastle could not get near him. His game just had everything and his feet are so quick - just magnificent. "He just has everything in his game. He destroyed Newcastle, but he will destroy some more teams this season." Chelsea head coach Antonio Conte, speaking to BBC Sport: "I think our start wasn't good enough. After going 1-0 down, we started to play with good intensity and good football. Our start was a bit slow. "We did well after only two days' rest. It was a solid performance despite the goal. We showed good motivation and good intensity. I made rotations in the game and the response of my players was positive. "I think that today, to play and win after two days of rest means a lot. Newcastle had the advantage with one day more of rest." Newcastle manager Rafael Benitez: "We made mistakes against good players. With the quality they have, they punish you. "We were in the game and you never know what can happen at one each, 2-1. A top side played against a team that was giving everything. "We knew him [Hazard] really well. He has good movements. You cannot control everyone. When he received the ball he can make the difference. We were doing quite well for a while but mistakes made the difference." Chelsea recorded their 16th Premier League home win against Newcastle - their joint-most versus one side alongside Spurs (also 16 wins). Conte has won all 17 Premier League games with Chelsea in which Hazard has scored. Newcastle lost their 70th Premier League game in London - the joint-most of any away side in the competition (level with Everton). Newcastle have won just one of their past 19 away Premier League games (W1 D4 L14). Since the start of season, Morata has scored 11 headed goals, more than any other player in Europe's big five leagues. Hazard has scored more Premier League goals versus Newcastle United than against any other team in the competition (six). Hazard has had a hand in 11 goals in his past 10 games in all competitions for Chelsea (eight goals, three assists). Since the start of last season, Gayle has scored 25 league goals for Newcastle, more than double any other player has netted for the club. Chelsea host Atletico Madrid in the Champions League on Tuesday (19:45 GMT) and are then at London rivals West Ham (12:30 GMT) next Saturday. Newcastle entertain Leicester next Saturday (17:30 GMT). Match ends, Chelsea 3, Newcastle United 1. Second Half ends, Chelsea 3, Newcastle United 1. Attempt missed. Jonjo Shelvey (Newcastle United) right footed shot from outside the box misses to the left. Assisted by Jacob Murphy. Corner, Newcastle United. Conceded by N'Golo Kanté. Attempt missed. Ciaran Clark (Newcastle United) header from the centre of the box is too high. Assisted by Matt Ritchie with a cross following a corner. Corner, Newcastle United. Conceded by Tiemoué Bakayoko. Attempt missed. Jacob Murphy (Newcastle United) left footed shot from outside the box misses to the right. Assisted by Jonjo Shelvey. Substitution, Newcastle United. DeAndre Yedlin replaces Mikel Merino. Attempt blocked. Victor Moses (Chelsea) right footed shot from the centre of the box is blocked. Attempt saved. Marcos Alonso (Chelsea) left footed shot from the left side of the box is saved in the centre of the goal. Assisted by Álvaro Morata. Corner, Chelsea. Conceded by Ciaran Clark. Substitution, Chelsea. Tiemoué Bakayoko replaces Cesc Fàbregas. Attempt blocked. Eden Hazard (Chelsea) left footed shot from outside the box is blocked. Assisted by N'Golo Kanté. Attempt saved. Eden Hazard (Chelsea) left footed shot from the centre of the box is saved in the centre of the goal. Assisted by Álvaro Morata. Substitution, Newcastle United. Jonjo Shelvey replaces Mohamed Diamé. Goal! Chelsea 3, Newcastle United 1. Eden Hazard (Chelsea) converts the penalty with a right footed shot to the centre of the goal. Penalty conceded by Matt Ritchie (Newcastle United) after a foul in the penalty area. Attempt missed. Eden Hazard (Chelsea) left footed shot from the centre of the box is close, but misses to the left. Assisted by Daniel Drinkwater with a through ball. Attempt saved. Eden Hazard (Chelsea) right footed shot from the left side of the box is saved in the centre of the goal. Assisted by Daniel Drinkwater. Attempt missed. Andreas Christensen (Chelsea) header from the centre of the box misses to the left. Assisted by Cesc Fàbregas with a cross following a corner. Corner, Chelsea. Conceded by Mohamed Diamé. Corner, Chelsea. Conceded by Florian Lejeune. Attempt saved. Victor Moses (Chelsea) header from the centre of the box is saved in the centre of the goal. Assisted by César Azpilicueta. Offside, Newcastle United. Chancel Mbemba tries a through ball, but Dwight Gayle is caught offside. Attempt blocked. Cesc Fàbregas (Chelsea) right footed shot from outside the box is blocked. Assisted by N'Golo Kanté. Attempt missed. Ayoze Pérez (Newcastle United) right footed shot from outside the box misses to the left. Assisted by Mikel Merino. Foul by Victor Moses (Chelsea).